All you have to do is choose your monogram initials and this lovely gold pendant will be personalized to your exact taste! This Heart Monogram Pendant in 14K White Gold is a wonderful way to own an original piece of jewelry, made especially for you so you can stand out in the crowd. This gold pendant features a solid, 14K white gold heart measuring 31.5mm by 28mm, not including the bale. The gold heart forms a base upon which the delicately scripted letters are attached. Choose up to three letters to be specially carved in gold at the center of this truly unique piece. The round curves of each letter join with the curves of the heart in a way that resembles a more complex, contemporary design. At first glance, you may see letters or you may see a beautiful gold pattern. Why not have a monogram piece of jewelry that is made just for you, especially a love-inspired piece such as this lovely gold pendant. A gold, heart-shaped pendant is such a nice accessory to wear and now is your chance to not only own one, but to have it monogrammed, too! Pendant measures 31mm (1 +") x 28mm (1 1/8") not including bale. Total length of pendant is 38mm (1 +") including bale. 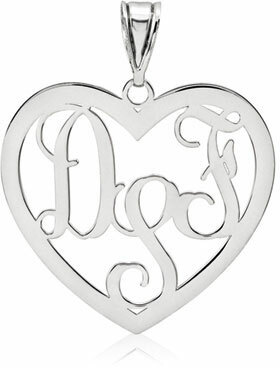 We guarantee our Heart Monogram Pendant, 14K White Gold to be high quality, authentic jewelry, as described above.